BSA Scout Troop 100 strives to provide the best parking program available for Oregon Duck football games. In order to provide a quality program, ensure compliance with laws and regulations, and to keep it safe for everyone; we ask that you please observe the following rules and conditions for parking in BSA Scout Troop 100 managed lots. Failure to abide by these rules may result in revocation of privileges, vehicle being cited / towed or criminal prosecution. Parking is a smoke free zone as noted in the Eugene City Code section 6.225 to 6.240- Smoking is prohibited in all public places and all places of employment within the city. · Prior to arriving, check your assigned parking lot and plan your travel route, as streets are strictly controlled on game days. · The speed limit while in our lots is 15 mph while on your way to your parking space. Please be safe and courteous to others by not exceeding 15 mph. · Vehicles will NOT be allowed to enter any parking lots until the lots officially open, 6 hours prior to kick off (but will not open earlier than 7am). The lot opening times will be posted on our website. Please DO NOT arrive earlier, as you will be asked to circle in traffic! Traffic cannot queue up on Scout Access Rd or MLK Blvd before the lots open. Game times do change, even after game times have been posted. Check on game day to ensure an appropriate arrival time. · Absolutely no overnight camping – your vehicle will be towed. · DO NOT DRIVE OVER CURBS. Violators may be cited and lose their parking privileges. · Follow directions when entering and exiting the lot. · Game day parking is first-come / first-served only. You can not save a space for someone else that will be arriving later. If you wish to park next to someone, you will need to arrive together. · Your Season Reserved parking pass hang tag must be displayed on the rear view mirror with your space number visible from the outside. VEHICLES WILL NOT BE ADMITTED WITHOUT A VALID PASS –NO EXCEPTIONS. · Game day parkers must display the game day pass on their dash so that it is visible from the outside. · Game day passes have no re-entry privileges. · Your Season Reserved parking pass is valid for the entire season, so keep it in a safe place. A $50 fee will be charged for replacement passes. Any express mail or courier charges for sending replacement passes must be pre-paid by the parking patron. · Parking passes may not be sold, transferred or auctioned. · Due to the particulars of the parking lots, some areas have been designated as saved for certain vehicles due to space or other issues. The volunteer parking workers have full discretion to park your vehicle in the manner they deem appropriate. Please cooperate fully. · Expect delays of one to two hours after games. Traffic flow is controlled by Eugene police. Vehicles may be prevented from exiting the parking lot between the fourth quarter of games and continuing up to 30 minutes after games due to pedestrian traffic. Please observe all parking lot personnel directions and cooperate with this delay. · DO NOT DRIVE OVER CURBS OR OVER ANY LANDSCAPED AREAS. Violators may be cited and will lose their parking privileges. Follow directions when entering and exiting the lot. · Absolutely no overnight camping (except in permitted RV spaces) – your vehicle will be towed. · Pavilion tents may be pitched when an additional space has been purchased. · Canopy tent size must be limited to a maximum of 10’ x 10’. · Tents and canopies must not extend into driving lanes or adjacent parking spaces within the parking lot (unless the adjacent space was purchased for this purpose). All tailgating material including but not limited to, tents, canopies, tables, BBQ's, chairs, Satellite Dishes, TV's grills, etc must not impede the flow of traffic, emergence personnel or adjacent parking spaces. · No open flame devices are allowed inside tents and canopies. · Using your parking space for any commercial use is prohibited. · Due to fire safety concerns, disposal issues with hot coals and ashes, and requests from the property owners, NO CHARCOAL, WOOD (WOOD PELLET) OR OPEN FIRES ARE ALLOWED. · Gas or propane grills or stoves may be used off the ground, on the back of an open pick-up truck or metal table. No open flame devices are allowed inside tents and canopies. · Limit of 10 guests per space. Vehicles are allowed a maximum of 10 persons associated with one parking space. Parties exceeding this number and caterer-sponsored events are prohibited. 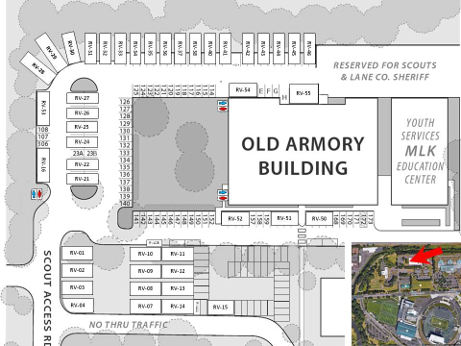 · Arrangements may be made to rent the front grass of the BSA lot for larger group tailgating options. Please Contact Us for details. · There is no RV or oversize vehicle parking available on the BSA or DYS lot. 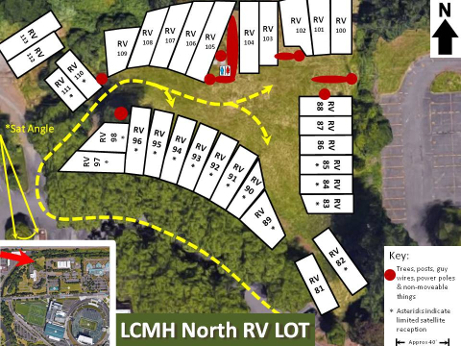 · Pursuant to our contract with Lane County, there are RV/oversize spaces available on the Lane County Mental Health and Armory lots only. · A RV Pass may be used with a single car. A car pass may not be used with oversized vehicles. · Portable toilets are located in many locations throughout the lot. Please be aware that there will be lines at the restrooms during times of peak use. Please plan accordingly. · Persons that choose to urinate in public will be immediately evicted from our parking lot for the season, with no refund. · Portable toilets will be locked one hour after the game ends. · Please lock your vehicle. BSA Scout Troop 100, The Oregon Trail Council and Lane County, are not responsible for lost or stolen items. Lock valuables in the trunk or take them with you. · Please use caution when walking from the parking areas to the stadium or game-related activities. · Children should be accompanied by an adult. · Lost and found - please Contact Us to inquire. · Notify parking lot personnel immediately of any safety issues. · Please pick up after yourself and your group! We have trash bags available if you need them, and we will provide them to you at no cost. Boy Scout Troop 100 operates four parking lots for Oregon Duck football games all lots are located across from Autzen Stadium. 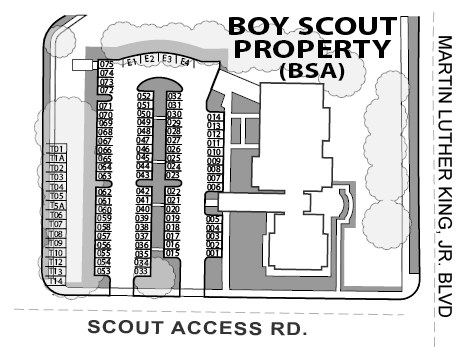 • The Boy Scouts of America council office (The BSA lot) at 2525 Martin Luther King Jr. Blvd. This lot is accessed from Scout Access Rd. which runs north off of MLK Jr. Blvd. 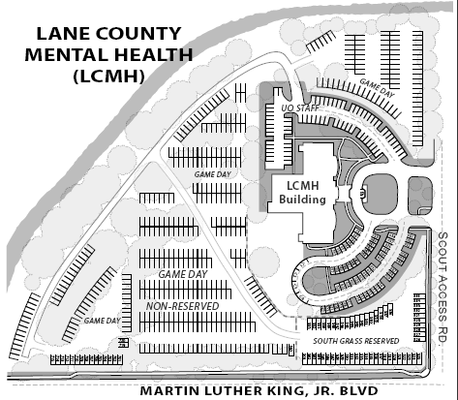 • The Lane County Mental Health (The LCMH lot) at 2411 Martin Luther King Jr. Blvd. This lot is also accessed from Scout Access Rd. which runs north off of MLK Jr. Blvd. • The Youth Services (Former Armory) at 2515 Martin Luther King Jr. Blvd. This lot is accessed from Scout Access Rd. which runs north off of MLK Jr. Blvd. • The Department of Youth Services (The DYS lot) at 2727 Martin Luther King Jr. Blvd. This lot is accessed north off of MLK Jr. Blvd.